“Urgup? You stop in Urgup?” I asked the bus driver slowly in English as I pointed to our ticket. “Yes, Urgup. Coming. Coming,” the man replied as he continued driving like a maniac. Something was seriously wrong. We had passed Goreme about an hour ago and, according to my trusty guidebook, Goreme is only five miles from Urgup in the heart of Turkey’s intriguing Cappadocia region. “Urgup, we’re going to Urgup!” my wife repeated loudly, approaching the point of hysteria. The driver nodded in agreement and grinned. We eventually arrived in Urgup seven hours later, in the middle of the night. A pack of wild dogs howled as they followed us to our inn. There was nothing wrong with my guidebook. In a rush, the driver had sped past Urgup to the next city. He didn’t speak our language, we didn’t speak his. Insanely frustrated, we arrived at the bus station, only to learn that the bus back to Urgup didn’t leave for another five hours. When we awoke the following morning in our Urgup hotel room, the strange scenery surrounding us seemed more bizarre than the previous evening’s events. We were inside a 1,000-year-old Byzantine monastic retreat carved out of a cave, now an 18-room hotel called Gamirasu. When Mount Erciyes poured lava over this region thousands of years ago, the volcanic ash formed a surreal, lunar-like landscape consisting of cone-shaped monoliths and layers of soft volcanic rock called “tufa.” Early Christians found the pervious terrain ideal for escaping persecution by Romans and Arabs. When wet, the tufa could be easily carved like soap to make caves out of the pinnacles as well as underground cities descending hundreds of feet below the surface. The first Christians came to the valleys of Cappadocia in the 4th century, led by St. Basil. They formed communities within the caves building living areas, bakeries, and workshops. The people of Cappadocia continue to live in these caves. The rooms are cooled by volcanic rock, which helps protect the 8th-century frescoes seen on the hotel walls. Steve Jermanok As a columnist for National Geographic Adventure, adventure travel expert at Budget Travel, and regular contributor on outdoor recreation for Outside, Men’s Journal, Health, and Sierra, Steve Jermanok has written more than 1,000 articles on the outdoors. He’s also authored or co-authored 11 books, including Outside Magazine’s Adventure Guide to New England and Men’s Journal’s The Great Life. His latest book is Go Now! Put Your Life on Pause and See the World. He’s currently an adventure travel expert at Away.com and blogs daily at Active Travels. 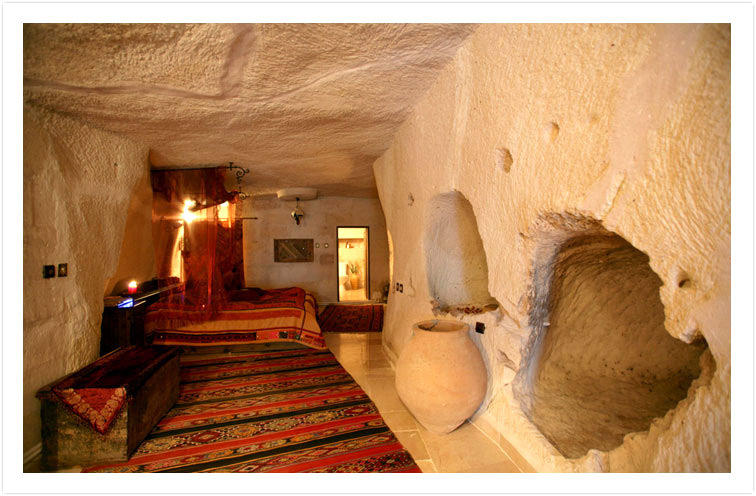 Cave hotels are the way to go staying in Cappadocia. They’re “cool” both in temperature and architectural style. Talk about staying in an accommodadtion steeped in history and style…can’t be beat. And there are so many amazing trails throughout the region leading to hidden caves, underground churches elaborately painted, winding throughout the canyons and agricultural valleys. So interesting. Maybe someday I’ll see it myself. I’ve stayed in The Gamirasu Cave Hotel, and in fact, the picture looks like the actual room that I stayed in..great country, great hotel.